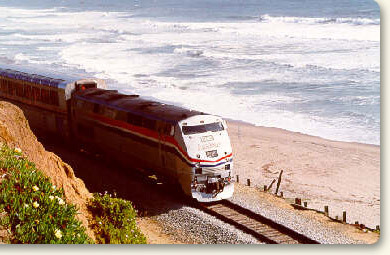 In conjunction with agreements made as a condition of acquisition of the 32-mile Santa Cruz Branch Line and to maximize transportation uses of the rail corridor, the Santa Cruz County Regional Transportation Commission (RTC) is assessing the feasibility of commuter and intercity passenger rail service. The RTC was awarded a Transit Planning grant by Caltrans to evaluate the feasibility for phased passenger rail service including estimates of capital and operating costs, an analysis of varying service scenarios and technologies; and connectivity to other bus and rail services. Visit the Passenger Rail Study page to see details of the study as well as the survey results. Meet sustainable communities, greenhouse gas emission reduction and natural environment protection goals. To receive information on this study, please visit the rail study page, and sign up for Rail eNews. Studies for potential passenger rail service analyzed potential service between Watsonville and Santa Cruz and to Monterey and the San Francisco Bay Area. Secured state funding approval on January 19, 2011. The “Around the Bay” rail study completed in 1998 in cooperation with the Transportation Agency for Monterey County for potential service between Santa Cruz and Monterey with linking service to the San Francisco Bay Area and the Salinas valley. The RTC hosted or co-hosted three different rail demonstration programs in 1996: the Return of the Sun Tan Special; the Coastal Cruzer/Flexliner; and, the First Night Trolley/RegioSprinter. The purpose of these events was to showcase various kinds of modern rail vehicles and explore their suitability for Santa Cruz County. In addition, these events have provided residents with a chance to experience not only different types of trains, but also transportation on the railway corridor. These first-hand experiences helped residents understand more about future mobility options in Santa Cruz County.